As the linguistic, cognitive and social elements of our lives are transformed by new and emerging technologies, educational settings are also challenged to respond to the issues that have arisen as a consequence. 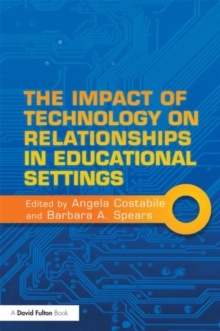 This book focuses on that challenge: using psychological theory as a lens to highlight the positive uses of new technologies in relationships and educational settings, and to advocate technological learning opportunities and social support where the misuse and abuse of ICT occurs. The Impact of Technology on Relationships in Educational Settings sets out to explore the role of ICTs in relationship forming, social networking and social relationships within our schools and has grown out of the European Cooperation in Science and Technology (COST); Action on cyberbullying, involving 28 participating countries, and two non-COST countries, of which Australia is one. This cutting edge international text offers cross-cultural, psychological perspectives on the positive uses of new and emerging technologies to improve social relationships and examples of best practice to prevent virtual bullying. This comes at a time when much of the focus in current writings has been on the more negative aspects which have emerged as new technologies evolved: cyberbullying, cyber-aggression and cybersafety concerns. This text is ideally suited to researchers and practiitioners in the fields of Educational and developmental psychology, as well as those specialising in educational technology and the sociology of education.